The Moody Mansion in Galveston, Texas. Romanesque architechture, a style of medieval Europe characterized by semi-circular arches. Beautifully seen, the arches make a wonderful focal point as well as perfect creative framing. Outstanding composition...what a lovely work of architecture...love the floor tiles! Excellent! Love the Moody - haven't been there since I lived in Houston which was more than 30 years ago. Great shot. 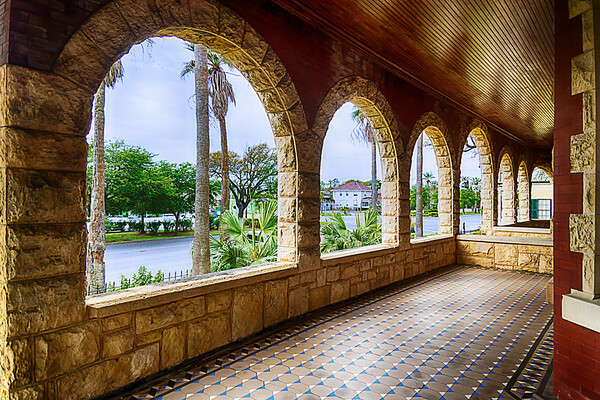 Love the arches framing the beautiful porch! I've never been to Galveston, but I love this mansion and its details--wouldn't mind seeing it in person. Great composition, super light and processing.